Things to do on the Central Coast. California is the most remarkable state in the union as far as we are concerned. We live and work on the Central Coast of California and we might not have a Disneyland in our area but we do have natural enchantment, adventure and exquisite views of the sea. We live in paradise and we want to help you find plenty of fun things to do in the area. You may be planning a visit to the Central Coast or you might be wondering what you would do if you did visit. Regardless, of which, we are going to tell you about all the adventures and things to do on the Central Coast of California. If you are looking for Central Coast Attractions and activities you are in the right place. We are going to give you the big picture involving the Central Coast, which will help you decide what would be the most fun and excitement for you and your travel partners. The Central Coast covers about 350 miles and is divided into 4 regions. This site is about the San Luis Obispo region. We are going to build websites for each region but first things first. The San Luis region starts in Pismo and runs all the way to Monterey. Actually, the region doesn't encompass Monterey and Carmel but we are going to include those two towns in the San Luis Region. We love the northern part of the central coast and the northern area as many distinct Central Coast of California attractions. Ok, now that you know the area of California attractions we are focused on, let's get started with the fun things to do. Boating on the Central Coast is a popular attraction. You can find boats to rent, charter boats, glass bottom boats and you can even go watch a few whales from a boat. The best place to find boat rentals and tours is in Morro Bay, California. For more information click the icon above. Maybe you would like to rent a kayak and ride the waves. The Central Coast of California has a number of places to rent Kayaks. You can rent kayaks in just about any beach town along the coast. For more information just click on the icon. You just have to go see the Elephant Seals. These big creatures are amazing. If you want several natural California attractions better than Disney, go see the seals. Click on Link for more information. If you are a surfer or a want to be surfer the Central Coast provides many places to surf. We even have a radio station that gives surf information. click on the icon above for surfing information. Are you a fisherman or fisherwoman? If you like to fish the Central Coast has many different areas in which to wet a hook. If you like fresh water fishing you can find it on the coast. Salt water fishing or surf fishing is a great way to spend a weekend. Click on icon for more information. We have two lakes in San Luis Obispo region of the Central Coast. These California Attractions are a great place to fish, boat or just have a picnic. Arroyo Grande has lake Lopez and this lake has it all: camping, skiing, sailing, windsurfing and much more. Click on icon for more information. Maybe you are into bird watching. If so the Central Coast is the place for watching birds. I can attest to the popularity of watching birds. I have a few I watch all the time, Woodpeckers. I wish I didn't have to watch them but they happen to love my house. Ok, bird watching is a great attraction on the Central Coast. For more information click on icon. To those of you who love to golf, the central coast is your kind of place. I have a neighbor who loves the sport. For information click on the icon. Hiking is my sport. My wife and I love to hike on the trails around Cambria, California. We love the outdoors and hiking give us a chance to walk the dogs and get a little exercise at the same time. For a list of trails in Cambria click on the icon. One of the leading attractions and activities of the Central Coast is biking. I wish I had dollar for every biker I have seen since I moved to Cambria. Biking is a popular way to see the coast and get exercise at the same time. For more information on biking trips on the coast click on icon. Hearst Castle is the number one attraction on the Central Coast. If you have never seen the castle you don't know what you are missing. For more information click on the icon. We have tried to give you as many Central Coast of California attractions as we possibly could. The central coast is fascinating and is best California attractions in the state. We hope you enjoy your visit to the Central Coast of California. If we can help feel free to contact us any time. 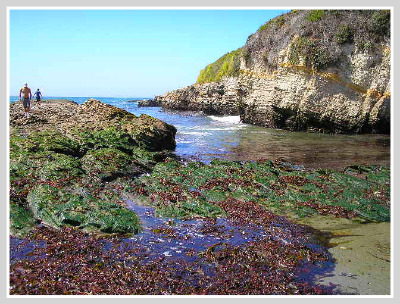 To see more pictures of the Montana de Oro watch the video below.